Jaguar is known for its excellent variety of features and impressive performance across its entire lineup of vehicles. The Jaguar XF Sportbrake continues this amazing tradition, adding in exciting capability one would expect from a SUV. The XF Sportbrake is essentially a sport wagon, filled with all the performance you would expect from a Jaguar. It makes a super option for those vehicle buyers looking for the extra cargo space one desires in a SUV but without the tall SUV-style body. The 2019 Jaguar XF Sportbrake comes in two trim levels. The XF Prestige Sportbrake starts at an affordable $64,575 MSRP. There is so much to appreciate on this luxurious performance Jaguar! Expect dependable power from the 2.0L turbocharged engine with 296 hp. The 19-inch Alloy wheels look terrific with the sleek body styling. The interior is comfortable and includes the top-of-the-line materials you would expect. The perforated grained leather seats have the perfect amount of support while allowing you to sink in for a luxurious ride. Cold weather is no challenge thanks to the heated front seats and heated steering wheel. Plenty of other features, such as the powered gesture tailgate, keyless entry, and front and rear parking aids, make this a vehicle worth bragging about. Move up to the Jaguar XF S Sportbrake for even more impressive performance and features. This Sportbrake trim level is powered by the 3.0L supercharged V6, producing 380 hp! Just imagine the exciting drives that will produce! One of the big stand-outs with the S trim is the ‘S’ Body Kit which includes a stylish sports front bumper and a variety of gloss black exterior accents. This trim level also shows off 20-inch Alloy wheels for an extra sporty appearance. Besides all the great comfort and convenience features available on the Prestige trim, the XF S Sportbrake adds on 18-way heated power front sport seats with embossed ‘S’ on the headrests. Whichever Sportbrake you choose, you can count on plenty of room for the family and all their gear. The Sportbrake seats five comfortably and leaves lots of cargo room. Expect 31.7 cu.ft. of cargo space behind the rear seat. If more cargo space is needed, fold down the rear seat for an impressive 69.7 cu. ft. This spectacular Jaguar is a rare vehicle, so you won’t have to worry about blending in with everyone else in the parking lot or neighborhood. 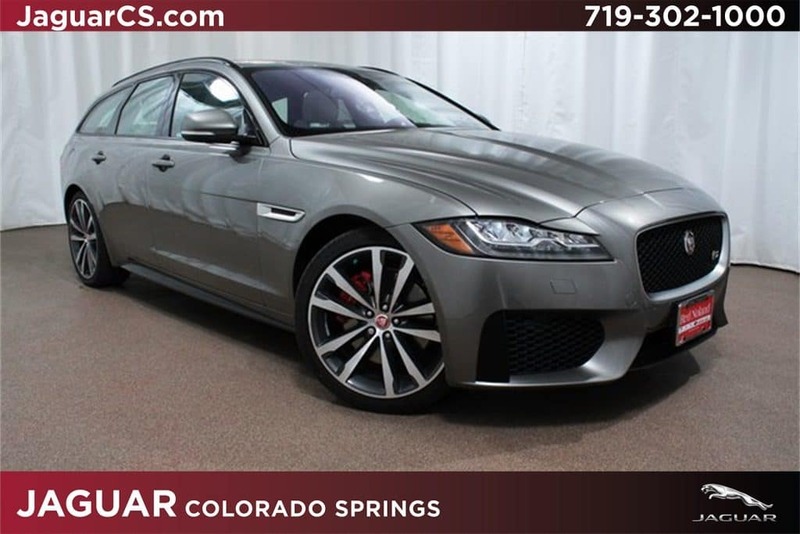 In fact, we have only one available 2019 Jaguar XF S Sportbrake at Jaguar Colorado Springs. You can get an exceptional deal on this performance wagon, discounted from the MSRP of $77,466 to the super Red Noland price of only $66,466. This beauty is loaded and ready for your next adventure, be that to the grocery store or a family road trip. The Sportbrake is equipped for and capable of making each of your drives more amazing!